It's still pretty cold out here. 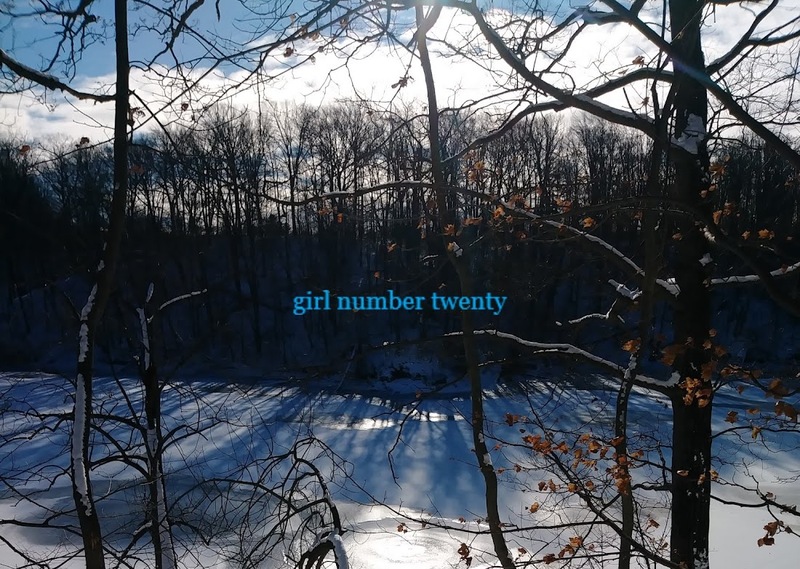 I had this idea in the fall, and it has served us well over the winter so far. 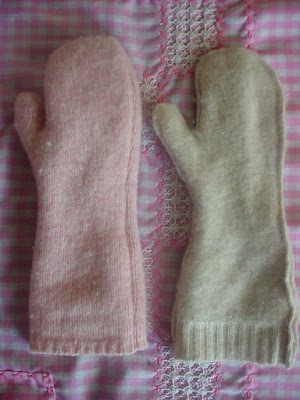 Being fundamentally a lazy person whose knitting is marginal but loves felt and likes to keep her hands toasty, this is the best and fastest way for me to whip up a pair of mittens. 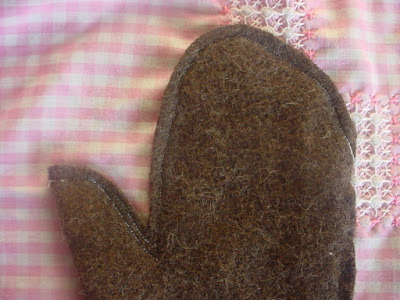 Find a felted sweater (or create one). 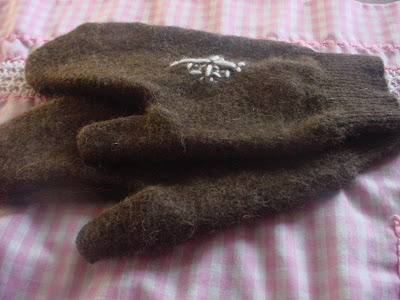 The ones that are the best for mittens probably started their lives as big mens' sweaters. 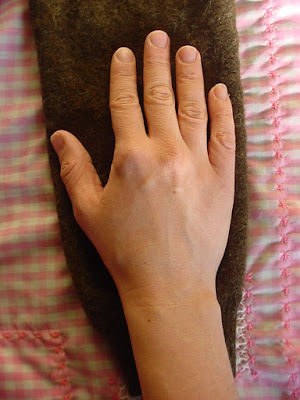 What you're looking for is a wrist cuff that fits comfortably and snug around your wrist after it has been felted. Put your hand in the wrong way in to see that it fits and that there's enough wiggle room for your fingers. I'm using a felted alpaca sweater (sooooo soft!). 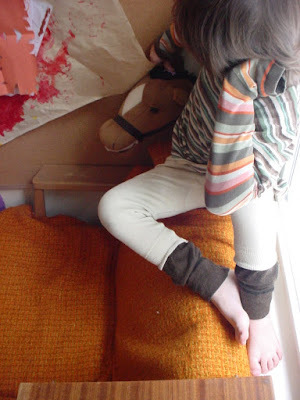 Also very important: find a helper to complete important tasks such as measuring the fabric and other random objects in the house. 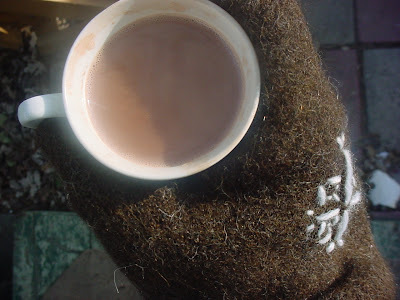 Place your hand on the sweater and trace around just the top with some tailor's chalk. 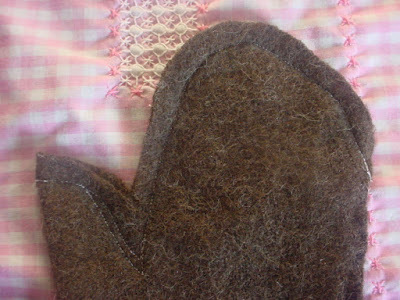 This way the sides of the mittens will already be done because you are using the existing seam and side. Cut out, about 1/2" from your trace line. 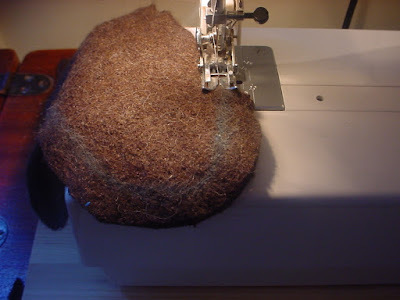 Using a straight stitch and loose tension (and a walking foot if you've got one), make a seam, following just on the outside of your trace line. 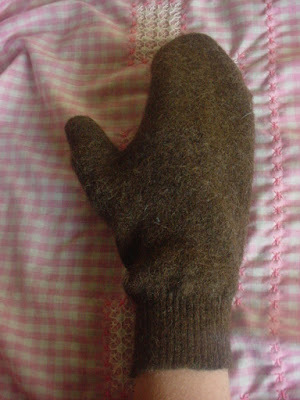 Turn the mitten inside out and test for comfort. You can see that I made an adjustment for around my thumb. Also, I've used white thread here for clarity, but you'll probably want to match the thread. Turn inside out and ta-da! Embellish, if you wish. If you don't, the whole project will probably take you all of ten minutes! 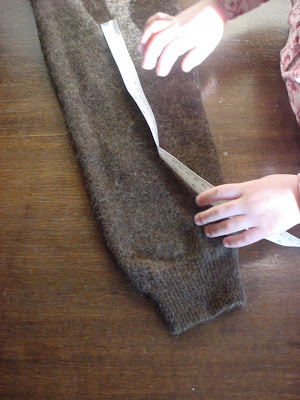 It's also useful to make one pair that is really soft for a liner and make a slightly larger pair out of more dense wool felt for the outside. 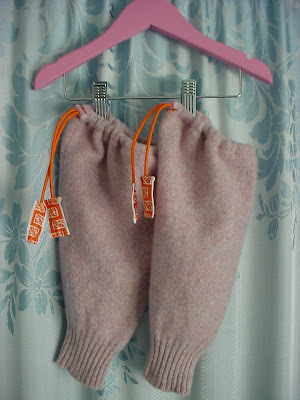 Then they're extra warm even on a windy day and they dry faster after outside fun. I surfed over here from your comment on Sharon's blog - these are adorable! I, too, wound up here based on a link at Sharon's blog - and am utterly charmed. I'm dreaming of the delight to be found in future visits, just for the beauty found here. Such love & joy in your writings! 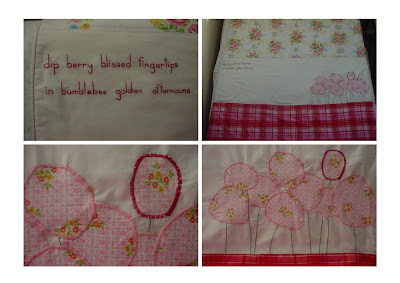 Your quilts are are stunning. Beautiful masterpieces. I just wanted to let you know that I have that green butterfly print from the butterfly quilt covering the cushions on my old glider. I have spent many a night rocking babies there. Here's to amazing taste! A lovely idea! 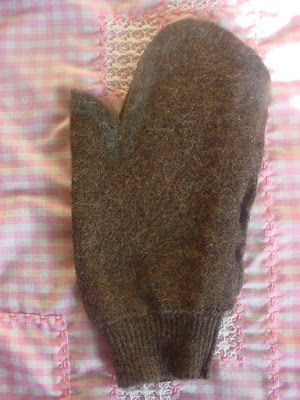 I am knitting a pair of gloves at the moment, but I am sooo slow, it will probably be summer by the time I'm done! This is much faster, thank you for the inspiration!